Ambassador Michael McFaul to Russia has Resigned, not merely from his post, but from the Obama Administration. McFaul was never popular in Russia and was often accused of trying to stir a revolution there. But the word around is that he is getting out and does not like the turn of events. Besides the US sending tanks back to Europe, the USA is now opening the pipes and starting to supply Europe with oil. There is deep concern about rising tensions with Russia and you have to look between the lines to see the patterns forming with strategic movements one step at a time. The USA is also accusing Russia of not reducing missiles according to the treaty – another sign of rising tensions. The rise in anti-government protests in Ukraine have been going on for weeks. What people do not appreciate is that there were attempts to do the same thing in Russia, but the people were arrested and that put an end to that. Some still talk about it on Facebook. In Russia they are portraying the rise of Neo-Nazi politics in Ukraine. This is once again part of the stage performance that both sides play up to justify whatever actions they need to take. At the very best, Ukraine would split in half East v West. That is truly the best possible outcome – but somehow it seems that the worst course is always preferred by mankind in general. Meanwhile, the US and EU officials are now pushing for a Ukrainian aid package in hopes of putting pressure to prevent Russia taking the country. But there seems to be a building trend over Ukraine and Russia can easily justify the fact that the East was once part of Russia and that the people there even speak Russian – not Ukrainian. This seems to be the focal point that is building. 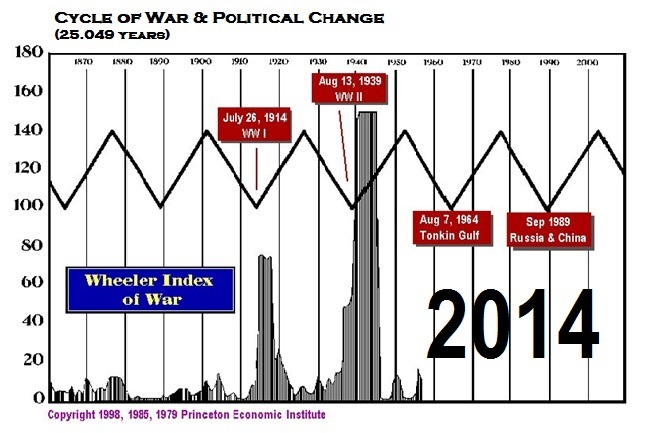 With the Cycle of War turning up here in 2014, this can easily become a very serious issue. Everything is starting to move it seems in preparation.